The availability of appropriate bicycle parking facilities at either end of a trip will heavily influence the decision to travel by bicycle in the first instance. The absence of such facilities, and the consequent risk of vandalism or theft, has been shown to undermine the investment in the overall network infrastructure. Cycle parking is an integral part of any cycle network, but it can also precede any dedicated cycle infrastructure, in order to address the cycle parking needs at the outset. 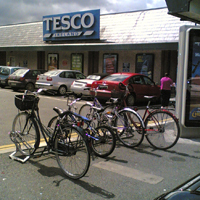 Support for mobility management plans – where early provision of cycle parking indicates a level of real commitment towards the bicycle. Cycle parking areas with a large number of parking places need careful design, and the parking area layout needs to be borne is mind when selecting the type of rack or stand to be used. In general, frame-supporting stands are more appropriate for small parking clusters of up to up to 10 or 15 stands. The NTA manual identifies key principles and approaches. 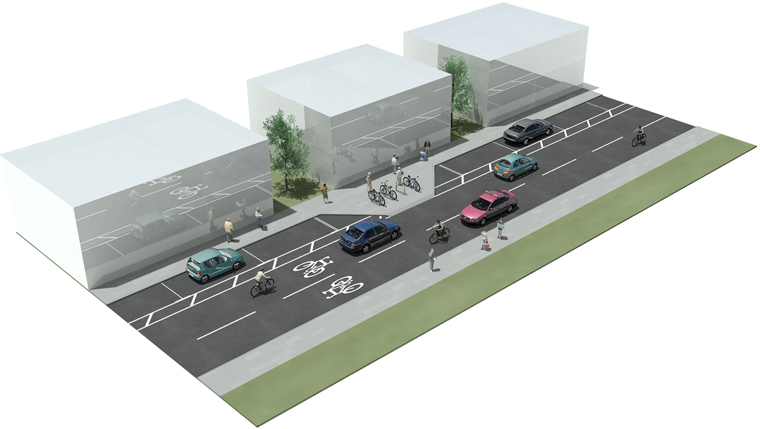 However, cycle parking knowledge and design is comprehensive and well developed in Europe, and provide solutions that have been developed in cities and countries with far greater experience of cycle parking issues. There are many different types of bicycle and bicycle value, different cycle parking duration, and different locations. The Sheffield Stand is not the solution for all situations. Convenience is less important for bicycles that are only used occasionally. How valuable is the bike? Has the bicycle particular features such as a trailer, or is it a tricycle? Does the bicycle have a luggage facility, requiring additional security? How close is the parking to the destination? How likely is there to be available parking slots? What is the area like, from a personal security point of view? How much public activity is there, a deterrent to vandalism? How visible is the cycle parking? Is the parking covered or exposed to the elements? How long and how often will the bike be left there? Will the bike be left overnight? Is it possible to get into the parking area, if the access is locked? In providing sufficient appropriate cycle parking, the designer will need to consider the relative merits of convenience, cost and quality. Longer term secure parking facilities are suitable up to 250m from public transport facilities. Are the facilities free to use, or is there a charge? Do higher quality and more secure bicycle parks, perhaps with on site bicycle repair facilities, warrant a higher charge? Outdoor bicycle racks outside versus indoor bicycle parking? Covered versus non-covered parking facilities? Parking as a stand-alone facility versus parking with additional services (e.g. bicycle-repair and rental)? The following gives an overview of the varying characteristics of parking at different locations that should be considered in determining the most appropriate parking facility. Proximity to origin or destination, up to 50m. Is the bicycle rack covered or exposed? Is the facility close enough to nearby pedestrian areas, bus stops, taxi ranks to provide sufficient passive surveillance? Possibly combined with other public services such as bike rental & repair outlets, shopping centres, etc. Located up to 500m from origin or destination. May require support service infrastructure. For new development proposals, cycle access and appropriate parking provision should be considered as a matter of course. 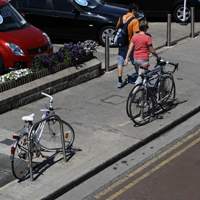 the level of uncontrolled cycle parking such as cycles locked to traffic poles, railings etc. This will give an indicator of the extent of unmet demand, and the appropriateness of existing facilities. how easy are they for cyclists to use? are the spaces between bikes to close (less than 750mm) or too far apart (greater than 1.0m)? are spaces available when cyclists stopping to park? are the cycle racks too close to moving traffic? are other users (especially pedestrians) affected when cyclists are parking their bicycles? Is there a preference for certain types of facility? Where are the current shortfalls? Where should new facilities be located? Whether bicycle parking should be subject to tariffs (paid parking)? How much would you be prepared to pay (is there an acceptable threshold)? Not all of these are in public ownership, and it may require co-ordination through mobility management initiatives to identify and support appropriate new provision. Within the plan, it should then be feasible to define priorities for short term and long-term implementation, and draw up a suitable implementation plan. 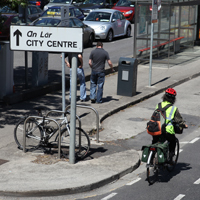 Local Authorities should clearly set out their policies and targets in relation to bicycle parking and communicate them to all the stakeholders at the outset. A system should be put in place to facilitate ongoing feedback from relevant target groups. This will assist in establishing consensus on priority areas and in identifying possibilities and opportunities for future action. 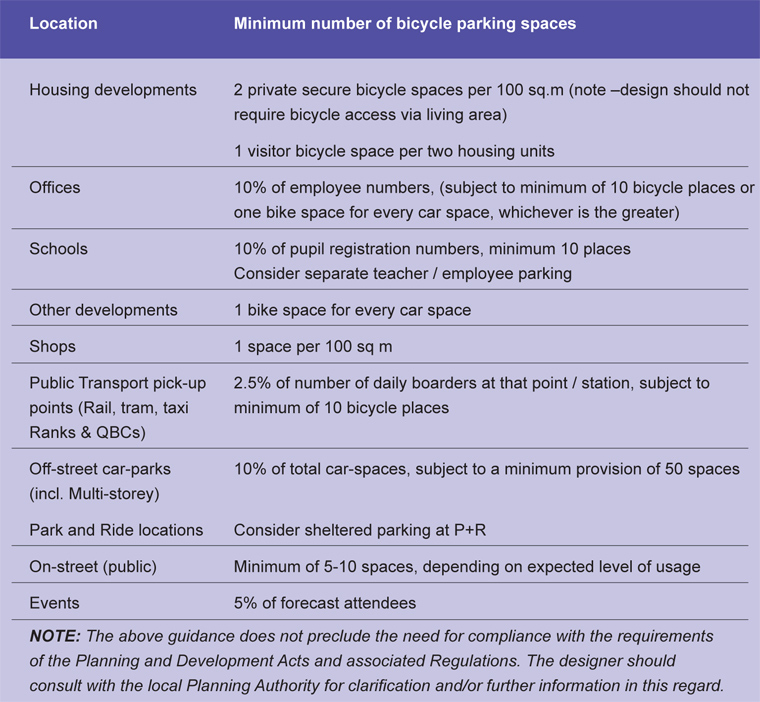 A Bicycle Parking Plan can be determined once priorities have been established, preferably by consensus with the stakeholders, and the necessary funding has been secured. Advertising revenue from bicycle parking structures may be a part of the funding. 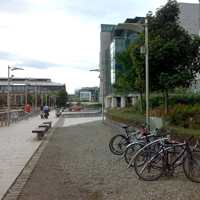 The Local Authority can then implement the Bicycle Parking Plan on a phased basis, subject to agreed arrangements for project management and control. In addition to the authority’s own inspections, stakeholders and end-users should be encouraged to monitor and provide feedback on the effectiveness or otherwise of the measures provided. There is a strong case to be made for re-assigning a certain percentage of on-street car-parking space to cycle parking as a way towards achieving sustainable transport/ modal shift objectives. Locations proximate to public transport and taxi ranks will provide a degree of informal supervision that discourages vandalism. Beyond a certain volume, however, or for particular destinations, on-street parking will not be enough, and the local authority will have to consider additional storage facilities. Dedicated commercial storage for bicycles will become more viable as the cycle market increases. 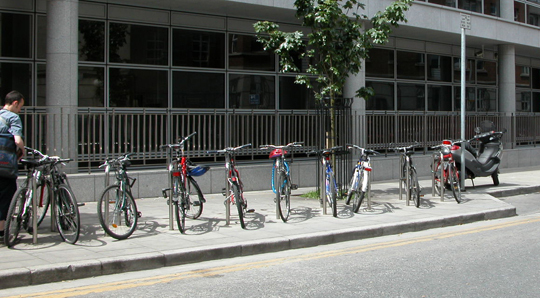 An element of bicycle parking should be included as part of all multi-storey/commercial (paid) car parks. Planning Authorities should include a requirement for bicycle parking in conditioning new development permissions. The following table gives guidance on the minimum number of spaces which should be provided initially at new private and public facilities. However, more generous provision should be considered in district, town and city centres, around public transport hubs, and on campuses. allowing the cyclist room to position/ lock / unlock the bike. All racks, bicycle stands and clamps should provide enough support to prevent any type of bicycle from falling over. This usually requires support for the frame and/or forks. The Sheffield Stand (U-bar) will achieve this, but there are many other architectural products on the market also. Units that are designed to grab the front wheel only are not generally recommended for public cycle parking. While they are often space efficient, they are ineffective for many tyre widths -see 5.5.9 Choosing an Appropriate Design of Rack or Stand below for further detail. 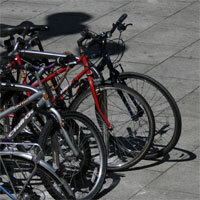 A key concern for many cyclists is having their bicycle stolen while it is parked. Different parking arrangements provide different levels of security. Bicycle parking facilities can protect a bicycle against theft in two ways, either by enabling cyclists to lock their bicycle to the rack, or by providing a built storage facility that can be locked or guarded by personnel and/or cameras. It must be easy for cyclists to lock the bicycle frame to the rack or stand. For additional peace of mind, many cyclists will seek to secure individual parts of the bike, such as the frame, wheels, trailer etc. This is done using a long bicycle lock that is woven through the various components and around the rack itself. These offer greater protection against theft or vandalism. They are particularly suited to schools or places of employment where full-time supervision cannot be provided but where security may be an issue. Access arrangements can include keys or gate codes being issued to individual cyclists, or can be controlled from a central location or by a caretaker. The bicycle parking cellar is an indoor variation of the locked storage facility for use in residential units, especially apartment blocks. Individual bicycle lockers are another way to provide safe parking. This solution is particularly appropriate for commuters completing the main part of their journey by public transport, and can be used at bus stops, tram, light rail, or railway stations. Lockers can be hired out to cyclists on a day-to- day basis, or longer-term if required, with keys issued from a central location. The disadvantage, compared to other locked storage units, is that they occupy more space per bicycle, and are more costly to build and maintain. 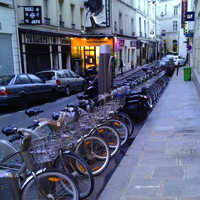 Guarded bicycle parking facilities may offer the best way to protect bicycles from being stolen in busy areas such as shopping districts, bus depots, central railway stations, and city-centre locations. 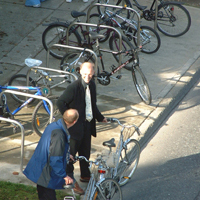 Full-time supervision is required, and cyclists will generally have to pay to park their bicycle. Facilities of this type are often associated with bike rental, repair and/or retail operations. 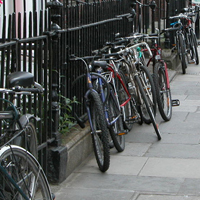 There must be enough space around individual bicycle parking places to allow cyclists to put a bag or pannier on the ground, and to stoop to access locks, pumps, lights, wheels etc. If bicycle lifts are provided to increase parking space, these are generally used only after the ground level parking is full, since there is an additional degree of physical effort and delay involved in accessing the bicycle on the upper tier. Lighting is important for cycle parking – it is necessary to have a cycle parking location well lit to allow for bicycle locking, for checking the bicycle equipment etc. It is also very important from the point of view of both personal security and bicycle security. Off-street parking, and its access, should be well lit. On street parking should be located where the street is well lit. Exposure to rain can damage bicycles and result in increased maintenance costs. This is particularly important for longer term parking at homes, schools, work places and at public transport stations. On-street racks and stands may be covered, if this can be incorporated into the streetscape appropriately. 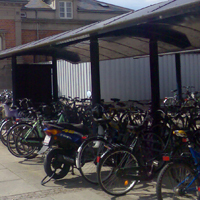 Covered bicycle parking facilities such as indoor storage units, bicycle sheds or lockers will help to keep the bicycle dry and in prime condition. Lockable bicycle sheds that provide added security, also serve a double purpose of providing weather protection. The location of cycle parking should be such that the time spent walking to / from the cycle parking is not a disincentive to using the bicycle, compared with other modes. It should also be possible to cycle directly to the cycle parking location, without prior dismounting. For offices, this means providing bicycle-friendly ramps, gates, barriers, ideally not mixed with car or pedestrian traffic. 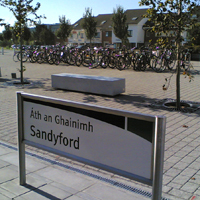 Commuters will often cycle to bus or rail stations if secure parking is available. Given the long parking duration, security is a particular concern. On high frequency routes, a degree of security is provided through passenger-activity around the station. In such circumstances, daily bicycle commuters may be happy with on-street cycle parking that is highly visible. For less frequent public transport services, and quiet locations, consideration should be given to locked options (e.g. bike-size lockers). Park & Ride sites will be mainly long-stay (all-day) parking. Reasonable security is required and can be provided achieved using bicycle locker or lockable shed, although this may not be required if there is full-time supervision on site. Such facilities can be paid or free of charge. Front fork-holding clamps and racks are space efficient. They are suitable where convenience of parking and removal is important, but only where bike security is not an overriding issue. The relatively tight spacing can make it difficult to stoop down between adjacent bicycles to apply locks. Frame-supporting bicycle stands are the simplest type of bicycle parking facility. They are often little more than a support rail, to which the bicycle frame can be locked without difficulty. Frame-supporting stands have the great advantage of being suitable for all types of bicycles and every tyre width. The Sheffield Stand is probably the best known example of this type of facility. The stands can be used on both sides, and should be set between 1.20m and 1.50m apart to allow the cyclist enough room to place and access the bicycle.